To open the show- I magically make the birthday child appear in an amazing Illusion, I then go on to perform a dynamic comedy magic show with magic, kids have only seen me perform on Saturday Disney. The Magic Show is fast and full of audience participation and laughter and Yes your child is the star of the show. Most magicians do the magic with the child helping- where as in our shows it's the child that does the magic with the magicians help. This is empowering for the child and makes for great moments throughout the show. Sit back, relax and let Aardy handle the kids for 2 hours! Does your child love MAGIC? If so, this is the package for you. This is the package when all you want to do is put the food out and the entertainer handles everything else. all while your child experiences the very finest magic in sydney. At the end of the 2 hours Your children will be able to perform magic! Sit back, relax and let Aardy handle the kids for 2 hours! with a great magic show and magic lessons. There are 7 magic tricks in total. 5 tricks are taught that we teach in this time frame35-45 Minutes of teaching the tricks. "1 of the best magicians we have ever had"
"Everyone is raving about you and your tricks"
Thank you for the wonderful show you put on for our staff and their children. WE have received so much positive feedback it was certainly a huge success! Kids Magic World has Developed 2 Amazing Birthday Magician Packages, honed to perfection from over 4000 shows performed. As a kids birthday magician we don't have deluxe and then super deluxe packages because we perform our best magic at every show- we don't make you pay more for the better tricks we know. This quick Video Shows a little of the Show plus a break down of what you get in each package. Why don't other magicians show you a complete trick? Comedy, Age relevant Powerhouse performance for not just the kids- but the adults as well. 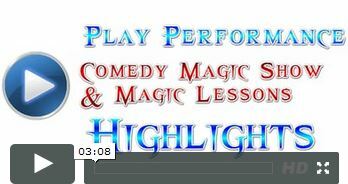 This is a dynamic laugh out loud comedy magic show designed for MAXIMUM participation at Birthday Parties. To the right you'll see an expanded performance of what I performed on Saturday Disney. You'll notice the reaction is complete audience participation- they are all involved- and the parents up the back of the party are having a ball as well. The Opening Trick- Don't show your child because this is in the show! At Kids magic world the child does the magic after the magician failed to do it. In essence your child can do the magic when the Birthday magician fails. This makes for a refreshing change from the magician doing all the tricks & the kids simply watching or holding a prop. Aardy does tricks in the show, but when it comes to the important ones- its the child that can do the magic. Its a different dynamic for a show and empowers the child more than simply being there and holding a prop. Fun Filled 35-40 minute Birthday magic show where your child is the star of the show. During the Show I perform the magic I performed on Saturday Disney. The show involves lots of comedy and audience participation and in the finale the birthday child gets a thunderous applause from the audience and you’ll want to pull your camera out for this. Colorful magic tricks, advanced sleight of hand and hilarious antics make this show one of a kind. Many Birthday magicians give away items that are not worth much like coloring in posters (which you can download for free) or lollies- and nothing ends a party faster than anaphylactic shock. Instead we provide Magic Lesson DVD's for EVERY child at the party. This is a long term gift and you can use it to put in your own party bags- or simply hand them out at the end. Kids love the magic so this allows them to learn some tricks when they get home. Balloons, DVD and a magic showbag! Every child also receives a Magic SHOWBAG full of tricks! There are no lollies in the bag- Just cool magic tricks including an appearing wand (A wand that magically appears) and several other tricks. A Perfect end gift for a Birthday Magician Party. How much space do you need for the Birthday Magic Show? as long as the kids can all sit in one area- that’s fine. Do you need us to provide anything? No Aardy brings everything he needs. How long is the set up? About 2 minutes. Yeah I know many magicians take 30 to 60 minutes to set up. - My set up is done where I park so when I walk in there is minimal time not entertaining the kids- when I walk in the door I am 99% ready. That 2 minutes is setting up the illusion where I make the birthday child appear. How many kids can you do the Birthday party for? up to 30 Kids is reasonable- over 30 and there will be a price increase because I have to set up speaker systems and perform a larger show. What age is this party for? The 1 Hour Package: 3 an up. Each age gets a different show- so the 8 year olds get a different show than a 6 year old, Over the age of 10, they are getting more adult related magic. The 2 hour Package: Is suitable for age 6 and up and some 5 year olds. Can the party be different ages? Yes and no, extreme ages say 1-15 is going to be tough, it is easy to compare watching TV. Kids at 15 watch different things than a 5 year old- even a 10 year old, and the magic show is the same, in these cases I do bit of both shows, but it is harder to perform. ages that are close say 5-7 year olds can be performed easily. What are some of the tricks you do as a Birthday Magician? This is simple an amazing show which is designed for maximum audience participation- The tricks I perform are simple to understand but are full of comedy, music, colour and amazement such as Making a Flower appear, making my magic wand magically levitate, making things disappear and reappear I also perform many of the tricks I performed on Saturday Disney. Yes, Inside or out- is not a problems- However- on a really HOT day- the magic lessons become harder as kids sweat, so please take note of the weather- the magic show can be performed in side or out side. What is The DVD given to all the children and how much extra does it cost? The DVD does not cost anything extra. The DVD teaches 3 magic tricks that children can learn very easily with objects found around the home. It is a fun bonus for dealing with Aardy. and is perfect to put into lollie bags. What is The DVD given to the birthday child and how much extra does it cost? This DVD is a bonus and does not cost anything extra. The DVD is similar to the DVD given to all the other children- the only difference is that it contains 10 tricks and not 3. How long is Aardy at the Birthday party? Do you stay to help cut the cake? Yes, I can stay and help by getting the kids to sing Happy Birthday and if you would like photos with me- that is OK too. Only if Aardy is booked towards the end of the party. 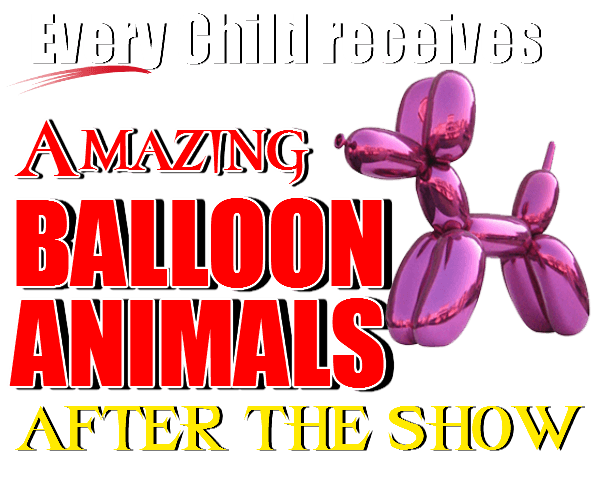 Are there animals in your Birthday Magic show? No, I don’t use live animals, I don't want to hurt animals. To use animals within a magic show damages them. Animals may also make a mess in your home, or bite your child. My focus is more on the audience participation. I want the children to be the STARS of the show, not an animal. Plenty of Birthday Magicians use animals and you can tell that the rest of their act is not so engaging because they focus every single picture on the rabbit and not the kids. I do use Rocky the Raccoon- a life like Puppet that kids think is real but its just a puppet- he allows me to do things that you couldn't do with a live animal. Are there any photo opportunities throughout the show? Yes, I even tell you when a photo opportunity is coming up. Can the parents watch the show- would they enjoy the show as well? It is optional for parents to be at the show- you can either sit back and relax elsewhere- but if you want to watch, Aardy’s show will entertain the kids and the parents watching. Aardy is a Merlin Award Winning magician- these are the Magician Oscars- he will entertain the adults- BUT the focus is on the kids.